Roscoe, our first bottle baby. We got attached to him and now….we have two bucks. Fortunately, they mostly get along. Mishap investigations are painful. The parties to the investigation usually involve good, otherwise competent people who are already suffering guilt and self-recrimination that no disciplinary panel can exceed. Major casualty investigations will take up to a year or more, which is a long time to have a sword hanging over everyone’s head, but necessary because it often takes time to fully comprehend what happened. The cause of an incident rarely, in my experience, involves a single act (or failure to act) or a single mechanical or technical failure; typically it is a chain of events that could have been interrupted at several points along the way. The proximate cause, “failure to maintain situational awareness,” is invoked often enough to be something of a sardonic joke. Countless procedures, policies, and cultural norms have been developed and refined on the basis of years of experience, in some cases dating back to the earliest navies. Experience, as the saying goes, is what you have right after you have made a mistake and many of those policies and procedures are written in someone’s blood. Almost two years ago, we lost three does because we were ignorant and because we lost situational awareness. It’s hard to talk about it, but I’m finally prompted to share this story because of a young lady who lost a pet goat last night and is feeling some guilt and remorse this morning. We were called last night by her uncle, who was desperate to get some help for them until the previous owner could arrive. In August 2009, we entered another kidding cycle. This was our fourth kidding cycle and we were relieved to finally be doing so in warm weather. Not only was the work more comfortable but there wasn’t the same urgency to find the kids quickly in order to prevent or treat hypothermia. We had the routine down pat — isolate the new mothers with their kids for the first few days, give some grain so boost energy for recovery and milking, treat umbilical cords with iodine to prevent infection, and otherwise give them some peace and quiet. On the third day after kidding, one of the does went down hard. She lay on her side in the rain, her head thrown back. I ran through the possibilities in my head: over-eating? No, her diet was identical to what we had done before. Milk fever? Possibly — she was unable to stand and she was shivering — whether from lying in the rain or from hypocalcemia, I couldn’t say. Ketosis? Symptoms matched. Called the vet and got some adivce. The main thing seemed to be to get her rumen going and give her supportive care. The next morning, she was dead. Worse, a second doe was down with similar symptoms and had to be euthanized a couple of hours later. Now we were looking for something communicable. We called the vet again — the position of the first doe’s body suggested tetnaus, but two tetnaus cases in a row was hard to conceive. Meanwhile, a third doe went down. Now we were looking at some very ugly possibilities. Veterinary farm calls are expensive — $200 just to show up and then the cost of treatment. 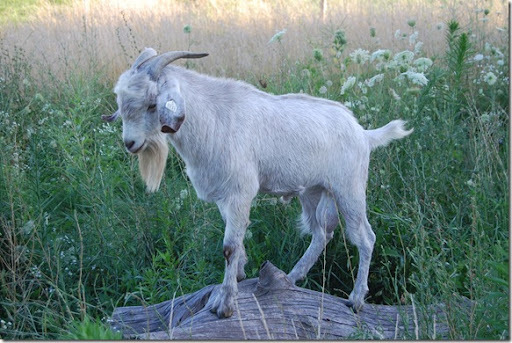 A typical production animal is worth less than the farm call and so goat producers generally have to live by their wits and some generous advice over the phone from the vet. We’d now reached the point where something was endangering our does, so we made the decision to get an autopsy on the third victim. We euthanized our third doe, brought her in to the veterinarian, and stood by as she began her work, beginning with an examination of the mouth and eyes. No sign of worms. A healthy gullet. Pink lungs. A nice layer of fat underneath the skin of the belly, leading the second veterinarian to exclaim, “This is the healthiest goat I’ve ever seen!” In his experience, goats are very skinny creatures and he observed that we were clearly taking good care of our animals. The liver was beautiful. And then, the vet pulled forth a distended stomach and opened up an organ that was full of grain. Our doe — and the others — had died of a rookie mistake, overfed with grain. We were in shock: these does had been handled exactly according to the standing procedure that had brought forth several healthy crops of kids. How could these does have overeaten? The answer lay in timing. All of our previous kidding cycles had been in cold weather (temps ranging from 30’s to -20F). These does, with plenty of fresh grass and warm weather, did not need the extra energy and were unable to process it. When the first doe fell ill, we failed to identify the change in circumstances and instead continued to look for more and more exotic causes for their illness. Had we been able (or willing) to re-examine the standing procedure, we might not have been able to withdraw grain in time to save the second and third does. The challenge to maintaining situational awareness is that it’s hard to correct for something that you don’t know is wrong in the first place. Assumptions and standing procedures only work until something changes; older and more experienced hands learn to anticipate those changes. Weather, as I learned in the Coast Guard and now know as a farmer, requires a constant adjustment to procedures. It’s written in blood. In June, 2010, my husband went out to do chores and found our purebred Kiko doe, Chevy, with her neck so tightly wedged between the corner of the stock tank and an ancient fence post that she was unable to open her mouth. She had ground her neck to hamburger in her frantic efforts to free herself. We were unable to push the post to free her; we quickly threw a chain around it and pulled it with the tractor. Our wildly skittish Kiko simply lay on the ground, to exhausted to object to being handled. We carried her into the barn and examined her injuries. Large areas of skin on both sides had been abraded, deeply in some areas. She was able to move her rear legs in response to stimuli, but could not move her neck. Temperatures had been in the 90’s, and our best guess is that she’d been stuck for at least 10 hours. Chevy lay on her side, clearly in shock but still willing to live. I administered an antibiotic and vitamins, gave her some oral fluid and electrolytes, and began cleaning the wounds. Again we had the conversation about the vet — how much could we afford to spend to save her? We got on the phone with the vet and discussed the situation. She was not optimistic but agreed that it was worth giving a few things a try. She prescribed a steroid injection and some Ringer’s solution; the steroid was to reduce swelling around the spinal cord and the Ringers for subcutaneous rehydration. After that, it was a matter of time and nursing care. the while, her eyes stared out at me, traumatized but not hopeless. Slowly, ever so slowly, she showed some slight strength in her neck and she would bicycle her legs. On the sixth day, we hauled her upright a couple of times. She immediately collapsed. On the seventh day, we hauled her up again and her legs flailed ineffectually. 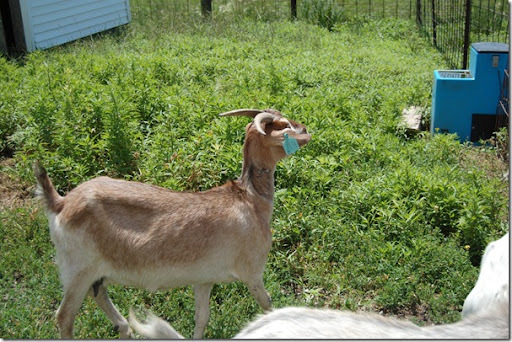 Later that day we hauled her up again and….she walked off a little ways and began to graze. It was only after her recovery that the vet told us she’d never before seen a goat get up after a third day. Never say never. I learned that in the Coast Guard and now I know it as a farmer. It’s written in blood. Chevy, about a month after her accident. These are three of our orphans from 2009 — bottle fed babies that grew up to be very tame does. Wow…I'm sorry for your losses but I appreciate you sharing. Who would have thunk, over feeding in warmer weather??!!! Really great piece of writing. Thank you for sharing your insights. Thanks for your posts. It is very encouraging and informative. 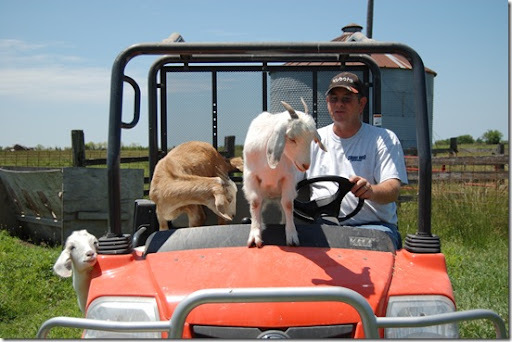 There are those of us who work really hard to keep our goats healthy and you and others like you who share their experiences are instrumental in saving livestock everywhere.